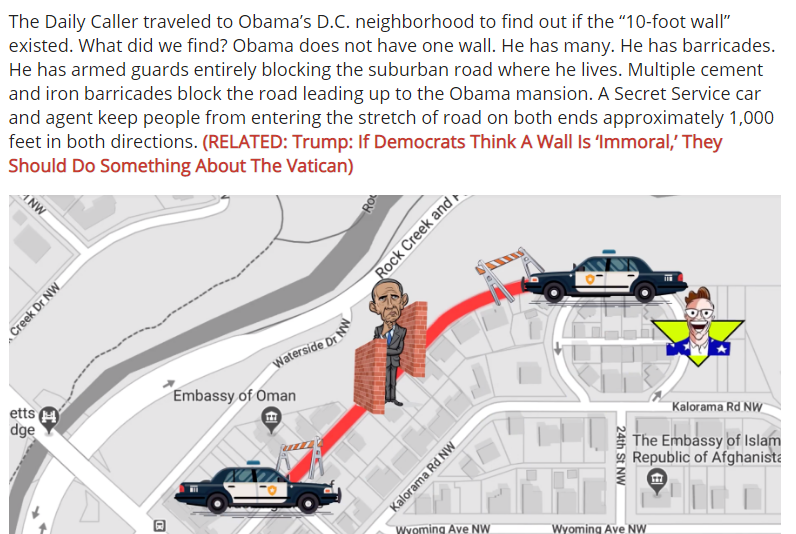 The Daily Caller’s Benny Johnson—a disgraced plagiarist—traveled to Barack Obama’s Washington, D.C., home to find out whether President Trump’s lie that the Obamas have a “10-foot wall” around their home was actually true, and left absolutely bewildered at discovering that the former presidential family has Secret Service protection. President Donald Trump has claimed that the Obama’s home has a “10 foot wall” around its exterior—a claim that is patently false—in order to argue in favor of his unfulfilled promises to “build the wall” and construct a physical barrier along the U.S.-Mexico border. Expert consensus is that Trump’s proposed wall will do very little to enhance border security, but wall funding is at the center of the impasse with Congress that resulted in the current government shutdown. After botching a journalism career with the kind of blunders that would prohibit any reputable reporter from advancing, Johnson has found a home at The Daily Caller, the right-wing political site founded by Fox News Channel host Tucker Carlson, and landed speaking gigs at Charlie Kirk’s Turning Point USA conferences. Under the 1958 Former Presidents Act, Obama, like all living presidents since Dwight D. Eisenhower, is entitled to Secret Service protection for the remainder of his life. Late last year, an apparent Trump supporter mailed explosive devices to political figures often disparaged by Trump, including Obama. Needless to say, presidential security detail is not comparable to immigration policy.